The majestic Victoria Falls, or Mosi-oa-Tunya (the Smoke that Thunders), are located on the Zambezi River, on the border of Zambia and Zimbabwe. Explorer David Livingstone named the falls for Queen Victoria when he first saw them in 1855. One of the seven natural wonders of the world, the falls have been attracting travellers and adventure seekers for decades; its pounding waters creating a mist that can be seen for miles and the sound of the falls, especially in the rainy season (November to April), make it difficult to hear anything else. There is a trail that runs along the cliff adjacent to the waterfall which visitors can use to reach the scenic viewpoints, and the Flight of Angels helicopter tour is a phenomenal way to see the falls from above. Although it is only accessible at certain water levels, and is certainly not for the faint of heart, there is also a natural pool right above the falls called the Devil's Punch Bowl; swimming just above the lip of the pounding waterfall is an amazing thrill! 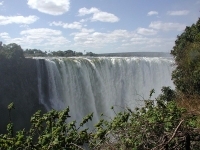 Guided tours to the falls are available from Livingstone, but it is easy to explore without a guide. Many tourists like to see the falls from the Zimbabwean side as well (especially during the dry season when the Zambian side gets quite dry) and crossing the border is usually quick and painless as the officials are accustomed to visitors popping over just to see the falls.